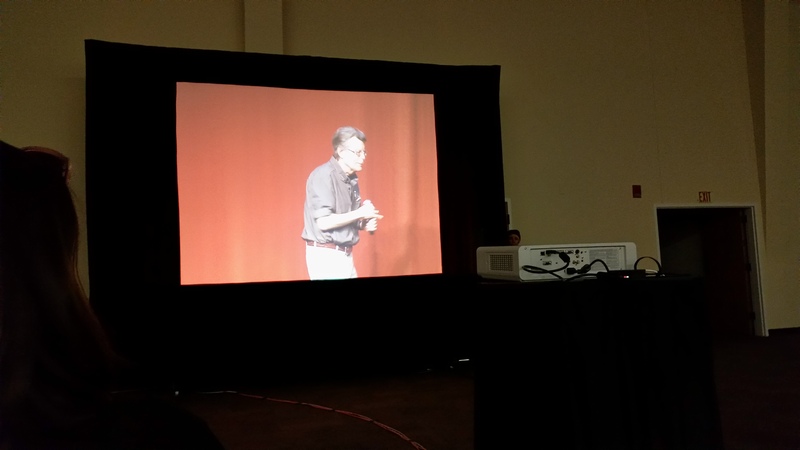 Like something straight out of the hit film The Lawnmower Man, a futuristic digital simulacrum of author Stephen King manifested in one of the “overflow rooms” of the Hughes Metroplex at Wichita State University on Friday. King visited Wichita as part of the tour supporting his newest novel, Revival, and while I arrived early to hear him speak, I didn’t arrive quite early enough. The event (a reading from the new book, some prepared remarks, and a Q&A) was to start at 6 pm; having secured my ticket before they quickly sold out last month, I thought I’d head over to the Metroplex at about 5, giving myself plenty of time for travel and parking. Around 4:30, my wife noticed a Facebook post from a friend who was already there: the line was three quarters of the way around the building already. I hopped in the car and left, just barely finding a place to park. The line was fully around the building by this time (about 5), and many more people got in line after me. It took an hour for the line to wind back around, an hour of standing in near-freezing weather; at least it wasn’t raining or snowing. Quite a few people gave up and left, or didn’t bother queuing up when they saw the size of the crowd. Seating at the event is general admission. Once the Lowe Auditorium is full, the remaining attendees will be seated in overflow rooms with excellent, live audio / visual feed to Mr. King’s presentation. But enough bitching. How was the presentation? It was fine: although King protested that he was terrified of large crowds and implied that he was at best a reluctant public speaker (supported by the fact that the Revival tour would only have six stops), he had an easy-going, conversational tone and was engaging and relaxed. A slight cold didn’t noticeably slow him down: he promised us it wasn’t ebola, and on that note observed that every time a new flu strain hit the news, sales of The Stand spiked. He sounded much like he writes, at least his non-fiction: I never once heard him use the word “fuckeroo” (although the sample he read from Revival did include “whoremaster,” another King standby). I’m more interested in King’s creative process than his books these days. 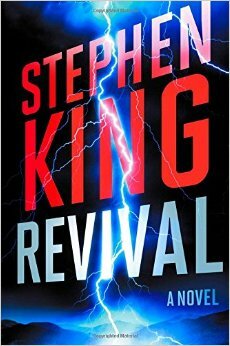 That’s not to say I won’t read Revival, a copy of which was included with the ticket price. But even King’s diehard fans tend to take his books as they come these days, cherishing the good ones and shrugging off the disappointments as part of the cost of being a fan of this most prolific of authors. King is like a baseball player, grinding out a season’s worth of games, day in and day out, and even the Hall of Famers don’t hit home runs every time they go up to the plate. I was aware of his general approach from his writing already: in addition to his memoir/handbook On Writing, King has often included writing and storytelling (and discussions of same) in his fiction, to the point that stories about writers are a significant subset of King’s work. As I wrote last summer, Misery, in addition to being a gripping story of suspense, is also something of a master class in writing as King surrogate Paul Sheldon thinks his way through the book that will preserve his life as a captive of his “biggest fan,” Annie Wilkes. Much of the imagery King uses to describe his process, such as seeing the story through a hole or window, is present in Misery and was still part of King’s discussion on Friday. I suspect this is one reason King continues to fascinate long after his ideas are not only no longer shocking, but even familiar: his willingness to allow readers into his thought process, to show his tricks, to let them come along as if he needed their help in telling the story, is endearing. It’s also as much of a pose as that of the author who reveals nothing (such as John Irving, whom King said told him that he doesn’t begin a book until he knows what the last sentence will be, to which King responded, “Jeez Louise”), and I’m not naive enough to believe that King has completely laid it all on the table for his audience. Still, the sense that King’s personality comes through his writing is palpable, and longtime fans accept him as they accept old friends or family members, foibles and all.